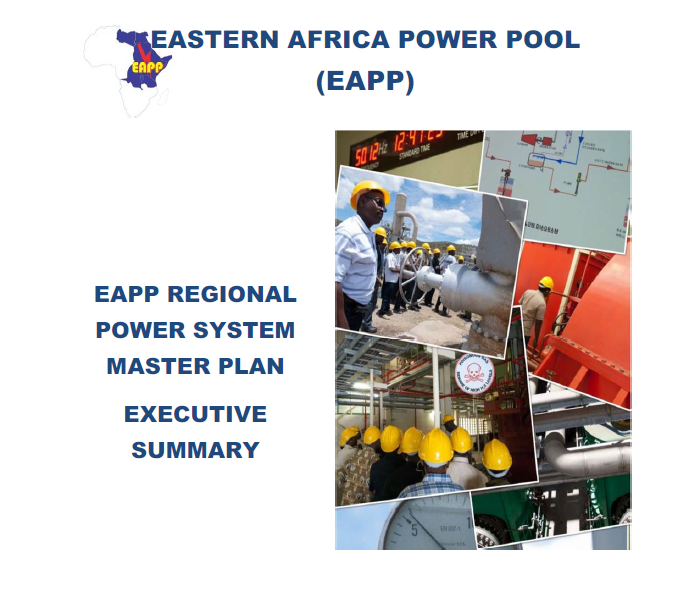 This is the second Master Plan published by the EAPP, the Eastern Africa Power Pool. The first Master Plan, published in 2011, is now updated and extended in scope with Libya and the DRC. The update is part of a Twinning project (June 2014 to December 2014) where the EAPP General Secretary, the member utilities and the consultants work together on concrete tasks. Intensive dialogue with the member utilities and Ministries has been a key input in the process. The EAPP Technical Subcommittee for Planning (TSC-P) has played an active role in the final development of the Master Plan. The recommendations of the Master Plan are based on simulations of optimal dispatch and least-cost investment in generation and transmission for the entire system in a number of specific scenarios. This main report is a concentrated description of the methods and the overall results. The report is developed to give a high-level overview and insight in main results. The report is supplemented by a series of appendices that cover data input and results per country. Also in the appendices, planning gap analysis, environmental analysis, risk analysis and network analysis are presented.